MOTOR NEURONE DISEASE, the dreadful affliction that seems impossible to beat, has claimed another prominent Australian sports personality. Cycling coach Gary West died at the weekend at the age of 57. Gary West was a world-class athlete in his prime, competing in the points race at the 1984 Olympics in Los Angeles as well as being an alternate on the pursuit team that won gold. He also won gold as a pursuit team member at the Commonwealth Games in Brisbane in 1982. But he made his mark on the sport mainly as a coach, especially in taking Anna Meares to gold and bronze medals at the 2012 and 2016 Olympics. He also worked for the Japan and United States cycling federations before being appointed head track coach at the Australian Institute of Sport in his home town, Adelaide, in 2008. An excellent piece in the Advertiser by Reece Homfray a few days ago. Here are a few exerts. THE enduring image of Gary West’s contribution to cycling is of the master coach standing in the middle of a velodrome in London during one of this nation’s greatest sporting triumphs. ‘Westy’ as he was affectionately known, was a world class rider in his own right but it was his ability to get the best out of others that made him a career coach. Moments after Anna Meares raced to her second Olympic gold medal by beating arch rival Victoria Pendleton on home soil, West was there to catch her and help her off her bike. He had not only masterminded the win with a plan dubbed ‘Know The Enemy’ which involved using one of Meares’ male teammates at training to replicate the tactics Pendleton would use on race day, but he also saved Meares’ career. In his blog which he would turn to to share his thoughts after being diagnosed with Motor Neurone Disease in September, 2016, West recalled what was said in those moments before the race. “’I can do this, I can do this’ I heard Anna whisper to me, half out of breath while I man-handled her and her bike in the Aussie infield pit area of the London Olympic Games velodrome,” West wrote. “It was September 8th, 2012, some 90 seconds earlier she had crossed the finish line to win the first race of a best of 3 against her fierce rival Victoria Pendleton to determine the Olympic Sprint Champion. He started in 1994 and took the role of national sprint coach in 2008, and continued right up until just after the 2016 Rio Olympics. He also coached in Japan and the US but Adelaide was home – or to be specific, the SuperDrome at Gepps Cross in the city’s inner north, was. West coached the men’s team sprint to the world championship in 2012 and Matthew Glaetzer and Stephanie Morton became Commonwealth champions in 2014 while Nathan Hart is now the fastest first-wheel rider Australia has ever had. West was committed and professional right to the end. He went to the Rio Olympics in August, 2016, knowing something wasn’t right with his body. His speech was at times slurred but his mind as sharp as ever and he had a job to do. So here they were again in the middle of the Olympic velodrome this time in Rio, heads bowed, Meares’ helmet almost touching West’s forehead as they plotted what seemed an impossible plan to win the women’s keirin final. Meares didn’t win, but she ran third, and salvaged Australia’s only individual cycling medal from the Games with bronze. The Magpie sightings have started. Adelaide Hills on Saturday Morning – How a beautiful morning almost turned to disaster. A cold but gloriously still and calm morning had me heading out towards Checker Hill via Anstey Hill, Houghton, Inglewood and Chain of Ponds. Houghton was a glorious sight as I descended down into the Triangular Village Square. The haze from the early morning wood fires hovered above the ground, the sun had just poked its head over the horizon, and the landscape around the square had a chance to show its beauty. And then there was Chain of Ponds (Millsbrook Reservoir). Its not often you get to see it millpond smooth, but this morning is barely rippled, creating some stunning panoramas. And this is where it all went so wrong. Finishing the last climb of the day – Corkscrew and turning right on the downhill stretch to Adelaide, I lost my line on the first right hander coming back down Montacute Road, concerned I wouldn’t corner I headed for the gap, only to find the gap lead to a ski slope of a track that I had no chance of navigating upright. So the only choice I had was to bail out. Fortunately I was able to land on the grassy knoll on the left hand side before I gathered much more speed. I was fortunate to get away with a few bruises, a strained neck and only minor scuffs on the rear derailer. It may have a minor bend but I cant tell with the naked eye – there is a minor gear jump attempt at times. Hopefully nothing too major. The Orica Scott team’s GC ambtions are well documented and their transition from a classics team that also targetted stage wins at the Grand Tours have been taking some interesting twists over the few years. Playing the long game by getting behind the development of the young Yates Bros, their belief in an injured Chaves and recently procuring the services of some good mountain domestiques Mikel Ituralde from Team Sky and Matteo Trentin from Quick Step Floors, along with some perenial favourites shows they are serious. Their Vuelta team this year is interesting. 3 future potential GC contenders in the Yates Bros and Chaves all in the same race opens up all sorts of options for the team. Stage 3 was the first stage with some serious climbing, and saw Orica Scott with the 2 Yates in the top 11 of the GC, and Chaves climbing strongly with Froome cross the line 5th after a sprint saw Nibali surprise the leaders and jump out and hold off to take honors. After yesterdays Stage 4, Chaves sits in 6th in the GC, 11 seconds behind Chris Froome who wears the red Jersey into Stage 4, Adam sits in 8th 39 seconds adrift of Frrome, and Simon has moved up into 10th, 48 seconds behind Froome. This year, to celebrate the two Yates brothers riding in the Vuelta, Scott, one of the teams major sponsors have provided them with an Addict RC Special edition, which is the preferred climbing bike for the team. The HMX Carbon Fibre frame and fork weighs in at just 790/300g, with Shimano Dura Ace Di2 electronic drivetrain and a slew of other high-end carbon components to keep the weight down. The paint job on the bikes is a black and white Yin & Yang thing. As you would know by now, I’m all about supporting the Australian cycling businesses and enterprises in my small way where I can. So I’ve decided to add a new feature to Wednesday Legs – Business of the Week. To set us off, I’m delighted to feature Pete, Lia and Andrew from Bio-Mechanics Cycles & Repairs. What is Bio-Mechanics Cycles & Repairs? We’re mainly a bicycle repair workshop, but we also carry a range of specialist touring bikes—such as Surly and Vivente—as well as Curve bikes and wheels, Whyte bikes, and accessories such as Syntace, Tune, Brooks, Ortlieb, SQ-Lab, Kask and more. Whereas most bicycle stores see repairs as a secondary arm to their business—and have the same mountain bikes and road bikes as everyone else—we’re the polar opposite of that model. Repairs are the focus of our business, and our expertise is in skilled and accurate technical work. We often get referrals from other bike shops, and we also do suspension work in-house rather than sending it interstate. We’re known for our attention to detail and customer service. Who are the people behind Bio-Mechanics Cycles & Repairs and what are their roles? Peter Hague has been working in bike shops since he was 15, and wanted to create a place where cyclists could feel that their bikes were being expertly looked after. Peter was the sole force behind BMCR for its first three years, until he was joined by his wife, Lia Weston, in 2007. Lia looks after the customer service, admin, and marketing (though she will change your tube if you ask her nicely). In 2009, Andrew Field joined the shop as BMCR’s second mechanic, bringing another 20 years of bicycle industry mechanical experience. We’re a small and dedicated team, and fortunately all share a high tolerance for Tool and Weird Al Yankovic music. In a paragraph or two, can you provide a brief cycling history of each? Pete started racing road bikes in the late 80s/early 90s, then went across to MTB racing in the mid 90s. He’s always had a fascination with bikes, even from a very young age, and it never left him. Lia is a dedicated commuter (she loves her steel Surly) and also hits the hills on her road bike when her writing (see next question) allows. Andrew started riding in Brownhill Creek shortly after he could walk. He’s been competing in mountain bike races since 1988, and is still having a blast. What are your team’s interests outside of cycling? Pete enjoys gardening, and eating and drinking stuff. Lia is a published author; her second novel, Those Pleasant Girls, was released in April, with a third book due out in 2018. In between writing and working, she loves to meander through the parklands with BMCR’s shop dog, Kif. Andrew has no interest outside cycling. What are your favourite cycling routes? Pete likes anywhere that’s not the test-ride block around the shop. Lia enjoys the old classic route of Norton to Lofty and down the old freeway. 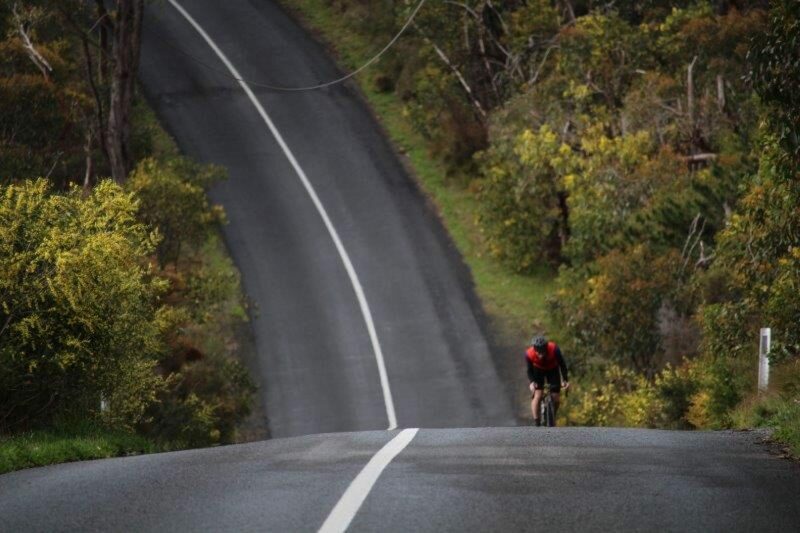 Andrew’s favourite route is the Sturt Gorge trails, including Craigburn Farm. What bikes do you have in your garage? Pete and Lia have a Baum, custom steel MTB, Santa Cruz MTB, Lemond, and their Surly 3-speed commuters. Andrew has too many bikes to mention. What do you like about Adelaide and why? Adelaide is a beautiful, progressive and accessible city. It’s been really exciting to watch the arts and food scenes in particular flourish over the past few years. From a cycling point of view, it also has the potential to be a mecca—hills one way, beaches the other, and a flat CBD that’s easy to navigate. Hopefully progress can continue to be made to ensure the promotion, safety and participation of cyclists of all ages and abilities, whether newbies or experienced. More people on bikes makes for a happier city! What are some of your challenges as a bike shop? We’re pretty busy year-round—which is great, especially as most people find us through word-of-mouth—but it often means that Pete works extremely long hours. (10 pm finishes during our peak season are not uncommon.) Taking more than a week for a holiday is not possible at the moment as it involves closing the shop completely. When considering expanding our staff, it’s very tricky to find mechanics with the skills we need; our reputation is based on our service work, so we’re extremely particular about the people we take on. What are some of the more common jobs you work on in the shop? We deal with a lot of mystery clicks and creaks, and also tricky gear issues. Often when people find us, they’ve already been to a couple of other shops without getting their problem resolved, and they’re happy to finally find somewhere that can fix it! We’re also known for our suspension work and problem-solving skills. A lot of our customers also have their regular service work done on a yearly or six-monthly basis; our general service is very thorough and basically involves stripping the bike down to a frame and rebuilding it from scratch. We also get a lot of tourers on their way through Adelaide who need emergency repairs; we have a lot of experience in touring bikes, and it’s always great to meet people who are seeing Australia from two wheels. Some of the distances ridden are just mind-boggling. Have there been any standout projects come through your doors? Lots, but custom builds are always special, such as James Raison’s Curve Belgie he used on the Indy Pac. custom 13-36 SRAM cassette – cog sequence: 13, 14, 15, 16, 17, 19, 22, 25, 28, 32, 36. Pete put together a specific cassette to give me usable gears for the flat, and a big range on the climbs. He individually chose cogs from multiple cassettes and made sure they would all work together. The shifting quality is fantastic and there’s no issues with chain slack. He’s a wizard. There has been a few major changes to cycling over the years, from uptake trends such as Mountain biking, Road, CX, plus the introduction of disc brakes onto high end Road bikes, not to mention the disruptive on-line technologies. Where do you think cycling is going over the next 5 years? It’s always difficult to guess these things, but greater electronics is probably an obvious one. E-bikes are becoming more and more popular, so it would be nice to see them evolve into something that isn’t a tank: most e-bikes need a motor because they weigh so much. Remove the motor and battery, and you have a bike you can pedal. Do you have any cycling partnerships you’d like to mention? We’ve sponsored the Adelaide MTB Club for 12 years, and we also sponsor the Kingston SE Triathlon. We’ve worked with remedial masseuse Holly Hicks from Bodyline Health for many years (though she’s just moved interstate *sob*). One of the services we offer is bike fittings, so when customers have musculoskeletal issues which are beyond our area of expertise, we’re happy to send people to the team at the South Australian Sports Medicine Centre on South Terrace. Thanks guys, a pleasure as always. You can catch up with Pete, Lia and Andrew here. Shop at their online store! **Special deal for Wednesday Legs readers mentioned at the bottom of this article. It doesn’t look much from the outside travelling down Anzac Highway heading toward Glenelg, but travelling back towards the City, the mural on the side wall gives a hint there is something special on the inside. Walking inside you’ll be treated by a warm welcome from the owners, and a deliciously tantalising smell of freshly ground coffee. The owners are two Colombians – Carlos Diaz and Daniel Valencia. Daniel has a degree in political science and a Masters degree in human resources, an is currently studying to be a Doctor at Flinders Uni. Daniel has also been a Barista for more than 4 years. Carlos is an Industrial engineer currently undertaking an MBA in marketing at Unisa. He has been working in the hospitality industry for about 4 years. As you know the King of the Mountain (KOM) is the award given to the best climber in any big cycling competition. Colombian cyclists in the 80’s (also in the last few years) were know to be the best climbers mostly focusing on the KOM classifications. Columbia also has some of the best coffee in the world from the Columbian mountains, so it seemed like an obvious fit to call the cafe KOM. KOM is more than a cycling cafe, it’s a Colombian coffee shop serving exquisite premium coffee, of course from the Mountains of Colombia, and pastries and cakes. It just so happens that cyclist love high quality coffee, so the cafe has built a reputation for a great stop off for cyclists. The Mural on the outside wall was painted by Sam Brooks. upgrade a small coffee into regular. And the bike on the wall, it’s a Mantci. More about them in the future.